When the new Star Wars-themed land, "Galaxy's Edge," debuts for Disneyland Park, May 31, there will obviously be some new eats and drinks to be had. As we await its opening, we finally got a sneak peek at the first announced consumable item, as Coca-Cola will team up with Disneyland to release custom-shaped Star Wars drink bottles. There will be four bottles in total, three being little soda orbs, and the fourth being a pretty standard Dasani bottle. 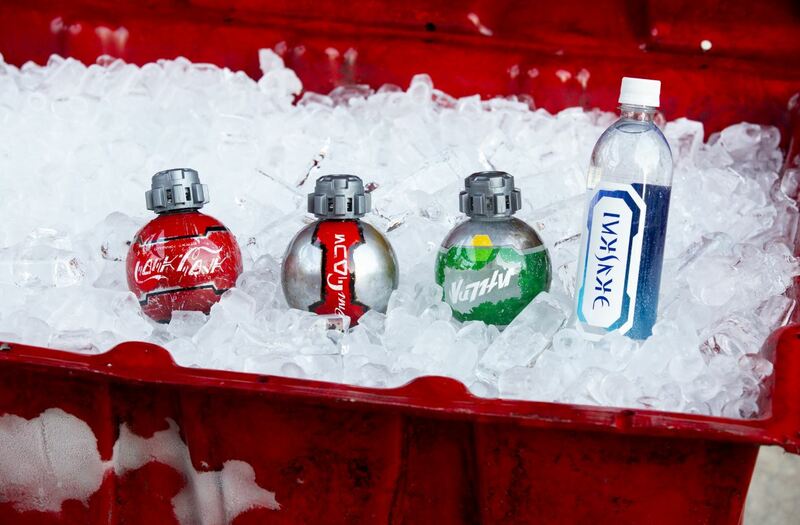 The orbs look like Thermal Detonators, and will be the vessels for Coke, Diet Coke and Sprite. “When we first approached Coca-Cola and shared the idea of bringing their products into the Star Wars galaxy in a new and unique way, they immediately saw the opportunity to give our guests the refreshing drinks they love in a way that maintained the authenticity of the story,” said Scott Trowbridge, portfolio creative executive and studio leader, Walt Disney Imagineering. You'll also notice the strange writing on the label which is written in Aurebesh text, one of the most commonly used alphabets in the Star Wars universe. The funky shaped Coke bottles will also be available at Walt Disney World in Orlando when its Galaxy's Edge land opens later this summer, August 29. While more food and drink products will likely start being announced before Galaxy's Edge opens, this is the first you can expect, and we'll keep you updated as more foods become available.